A vivid, over-blown, way over-the-top heist drama, 3000 Miles To Graceland is a stylish rough diamond, waiting to be rediscovered as a cult classic. It's Elvis impersonator week in Las Vegas, with countless versions of the King livening up the Strip. Michael (Kurt Russell) has just been released from prison and at a small desert town outside Vegas, he meets and falls into bed with Cybil (Couteney Cox), who has a brat of a young son Jesse. Michael then joins a gang headed by Murphy (Kevin Costner), a vicious criminal with an unhealthy Elvis obsession. 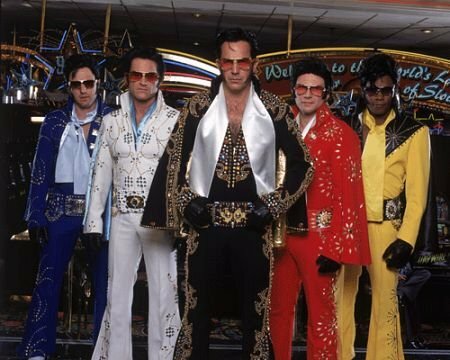 Michael, Murphy, and three heavily-armed members of Murphy's group all dress up as Elvis impersonators, and in a fiasco of a robbery, they hit a Las Vegas casino all bullets flying. They cause mayhem but escape with casualties and a lot of stolen money. Murphy quickly turns on all his fellow gang members, killing them all except Michael who is saved by a bullet proof vest. Murphy's plan is temporarily derailed when he crashes his car in the desert, allowing Michael to grab all the loot and escape with Cybil and Jesse. With Murphy in pursuit, and federal agents picking up Murphy's trail, Michael makes his way to a prearranged meeting with money launderer Peterson (Jon Lovitz) in Idaho. Meanwhile, Cybil has her own intentions to grab all the money, complicating Michael's life. With SWAT teams closing in, Michael needs to save Jesse, while Murphy makes an epic stand to seal his destiny. Director and co-writer Demian Lichtenstein has just one thing in mind: a massive sensory over-load experience. 3000 Miles To Graceland is all about colours that are too sharp, bullets that are too numerous, characters that are too desperate to care, and an Elvis story that is too incredible. Lichtenstein makes it work, injecting boundless energy and never even locating the pause button as the film hurtles towards a manic conclusion. The cinematography and editing are all geared towards achieving maximum style points, and capture Vegas, the desert, and the carnage in glorious constant motion. 3000 Miles To Graceland benefits from three performances with enough power to light up the Vegas strip. Kevin Costner is chilling as a man handed a really bum deal in life, and determined to make the worst of it. Kurt Russell anchors the film while chaos reigns around him, and Courteney Cox delivers a spunky performance in one of her few memorable movie roles. Lovitz as the money launderer Peterson cranks up the doomed smarminess in his short on-screen time. If the life of Elvis was all about excess, 3000 Miles To Graceland may be the perfect metaphorical homage to the King.